Israel accepts clarification from Hungary's Foreign Minister regarding Prime Minister Orban's praise of Miklos Horthy. Israel has agreed to accept a clarification from Hungary's Foreign Minister regarding the country's Prime Minister's recent praise of Adolf Hitler ally Miklos Horthy, Haaretz reported on Sunday night. 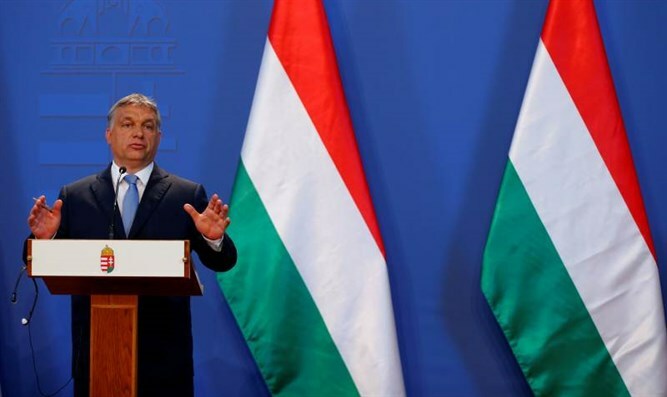 Prime Minister Viktor Orban gave a speech in Parliament on June 21 in which he called Horthy and other Hungarian leaders “exceptional statesmen” for leading the country after the traumatic disintegration of the Austro-Hungarian Empire after World War I. A park has already been named after him in Gyomro, on the outskirts of Budapest. In 2013, a bust of Horthy was unveiled outside a Budapest church, causing protests among locals. Orban's praise for him angered the local Jewish group, as well as the World Jewish Congress (WJC). WJC President Ronald Lauder said his organization would always condemn “deplorable actions” like Horthy’s and rejected any attempts to excuse or justify them. “The horrors that Admiral Horthy inflicted on the Jewish community of Hungary by stripping them of their rights and their humanity, and his role in the deportation and murder of hundreds of thousands of Jews, can never be excused,” Lauder added. The Hungarian Prime Minister's remarks placed Israel in an embarrassing position as Prime Minister Binyamin Netanyahu is to meet Orban at a summit in Budapest on July 18, Netanyahu’s first visit to Hungary since he returned to the prime minister’s office in 2009. Four days after the speech, noted Haaretz, Israel’s ambassador in Budapest, Yossi Amrani, issued a statement noting that Orban’s words were very disturbing and the collaboration of the Horthy regime with the Nazis must not be forgotten, as well as the race laws enacted during his time and the destruction of Hungary’s Jewish community. “Whatever the reason and national goal might be, there is no justification for such statements,” Amrani said in a public statement. A senior Israeli official told Haaretz that Amrani also communicated through quiet channels with senior officials in the Hungarian Prime Minister’s Office and the Foreign Ministry in Budapest, demanding clarifications and saying Israel hoped Orban’s statements would not cast a pall over the upcoming summit. A few days later, when the Hungarian government had still not issued a clarification, Amrani gave an interview on a major Hungarian television station and reiterated Israel’s demand for clarification and a warning that the tension could hurt the summit. Quiet diplomatic contacts had been underway since Wednesday in an attempt to resolve the crisis, according to Haaretz, and on Saturday Foreign Minister Peter Szijjarto spoke by phone to Amrani to put an end to the affair. In a statement to the press released after the phone call, Szijjarto said he had made clear to the Israeli ambassador that the Hungarian government had zero tolerance for any kind of anti-Semitism. The foreign minister added that the positive part of Horthy’s legacy was his work to stabilize Hungary after World War I, but the very negative part was “his historical sin,” when contrary to his promises he did not protect the Jewish community, passed laws against it and that hundreds of thousands of Hungarian Jews were killed in the Holocaust. “All of these are historical sins whose seriousness cannot be diminished,” Szijjarto clarified. While Szijjarto did not clarify Orban’s remarks, apologize or express regret for them, the Prime Minister’s Office and the Foreign Ministry in Jerusalem decided to act with restraint and end the affair.